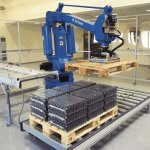 Many people maybe new to the world of robotic palletisers. This is a relatively new concept but has been utilited with great results for many business. Robotic palletisers are able to pick boxes or crates from a conveyor to be stacked with millimeter precision on a pallet. 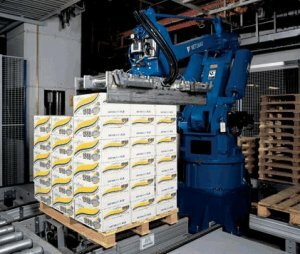 This is often a lengthy and labour intensive task without a robotic palletiser, but packing speeds and health and safety can be greatly improved with the use of a robot. Andrews Automation have significant experience with robotic palletisers and work with leading names such as ABB, Motoman and Kawasaki. Due to this they can integrate the best possible solution for your environment. This can be using your existing equipment or new equipment can be specified to create the best possible outcome for your business.